If you cannot view this e-mail, please go to http://www.stanleyfoundation.org/courier/promo74spring2012a.html. The January 2012 conference titled ”Responsibility to Protect: The Next Decade” may very well have marked a turning point in global understanding of the Responsibility to Protect (R2P) doctrine. While there is still vigorous debate about “how” best to prevent and halt mass atrocities, a cross section of international participants in our event underscored widespread agreement that the task is an appropriate and necessary part of fostering a global community. Once, vocal groups of nations could claim that most domestic cases of mass violence were internal matters unsuited for discussion at the international level, including the UN Security Council. Today, that idea no longer holds sway. 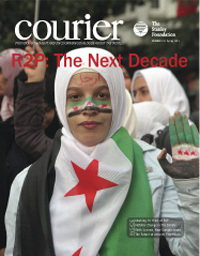 Finally, in this issue of Courier, foundation program officer Rachel Gerber looks beyond the horizon at the challenges R2P will face in its second decade of existence. She reminds us that at the 2005 World Summit, leaders “reinforced R2P’s focus on peaceful, preventive means” rather than pigeonholing R2P as merely a rationale for military intervention. As Gerber points out, “Setting the sights of global policy to prevent rather than simply respond to mass atrocity threats raises deeper questions about the internal dynamics that drive atrocity violence.” Answering these questions and responding to those dark motives will be vital for R2P’s future. Read more. R2P: The Next Decade was organized by the Stanley Foundation, the MacArthur Foundation, and the Carnegie Corporation of New York. This message has been sent by the Stanley Foundation as a courtesy to past participants of foundation events or others who have expressed interest in our work. To be removed from this list, simply reply to this message with the word remove in the subject line of your message.